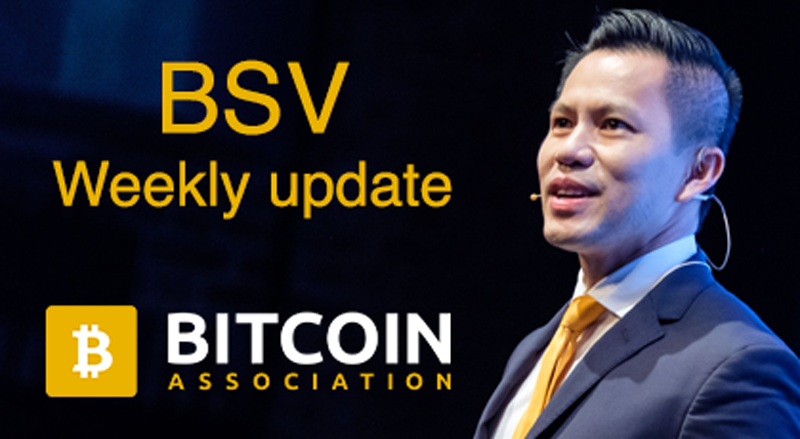 In this edition of the BSV Weekly update, we review more recent BSV developments from the community and enterprise. This includes the exciting news that several services have added BSV support and one service has been revived on the BSV blockchain from its now defunct BTC days. 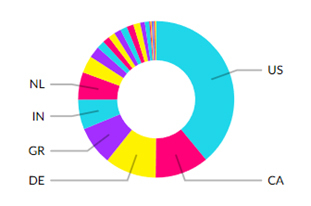 It’s terrific that more and more application developers are seeing how BSV can power projects that BTC cannot. You can now easily sign and verify a document on the BSV blockchain. This project has been resurrected on BSV after it was once on BTC but became impossible to use due to high fees and restrictions imposed on the OP_RETURN data size. With Easy Sign, you can upload any document you want to sign. The document is not actually uploaded to Easy Sign’s servers; instead the service calculates a cryptographic hash of the document. Your data is still private, and Easy Sign do not have access to the document’s contents. You can also add a message, email address and/or your name to the document signature. Easy Sign then creates an OP_RETURN entry into a BSV blockchain transaction for you to sign, using Money Button. You then swipe the Money Button widget and pay for sending your proof to the blockchain. This guarantees that the document was uploaded and signed with Easy Sign. This very welcome addition to the BSV ecosystem, brought back to life from its former BTC days, is our “Satoshi Shout-Out” this week. Cryptartica, the online design marketplace, are now accepting Bitcoin SV (BSV). 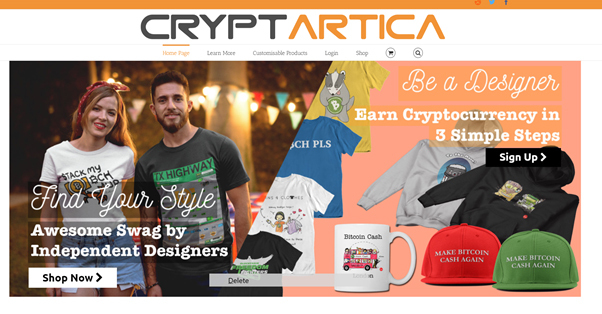 Cryptartica allows customers to buy premium merchandise using designs uploaded by artist users; customers can pay with Bitcoin and the artists earn Bitcoin. The platform accepted Bitcoin Cash before the November 2018 hard fork and will now also support BSV. As the company stated, “We’ve decided that accepting both is the best course of action for us and our customers, and we are looking to resume from where we left off in 2018”. This means users can pay the artists in BSV and the artists will be able to receive payment in BSV. 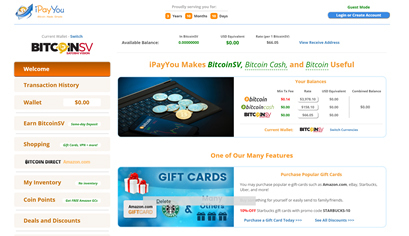 iPayYou announced that they are now supporting BSV, It is a digital currency wallet that has integrated shopping in order to make Bitcoin more useful to consumers. iPayYouWallet is the first and only BitcoinSV wallet that allows you to transfer your BSV value to Amazon.com with a simple, easy click-of-a-button, and then spend the funds on Amazon.com. This Chrome plug-in allows you to visit b:// urls directly via search bar and replaces b:// resources on websites with content provider resources. The b://urls are a way of finding a BSV transaction easily on the blockchain, making this extension a handy tool for users. To use it you just click the search bar, type “b” and press TAB, enter txid and away you go. BSV101 is a site aimed at people who are new to cryptocurrency. 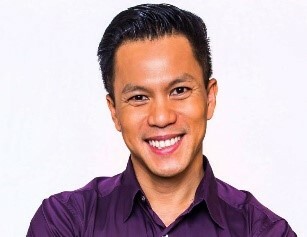 Its intention is to provide newcomers to BSV with as much information as possible to increase their knowledge about the BSV blockchain and to connect them to the BSV community. 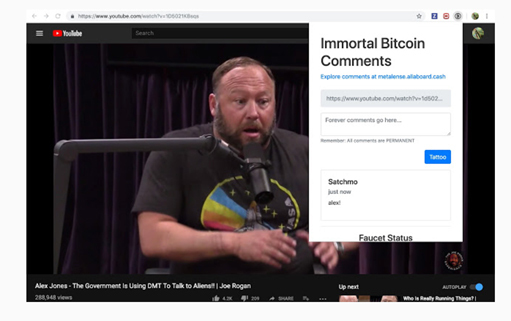 Users can visit https://metalens.allaboard.cash/ to explore comments posted using Metalens. Coin2speech created by twitter user @hypergalaxycash, gives users the ability to translate any text into speech with the google text to speech AI API. 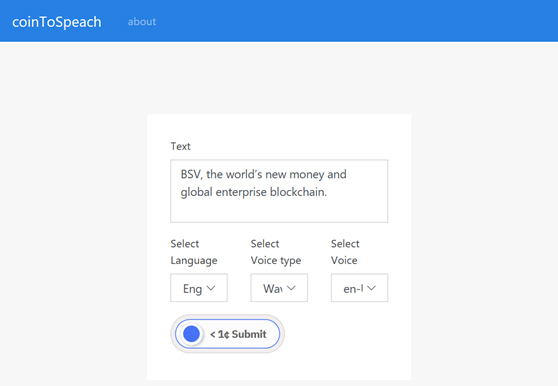 This new text-to-speech engine allows you to make up to 150.000 characters per request paying with Bitcoin (BSV), more than the Cloud Text-to-Speech that may be free but only allows you to do 5000 per request. 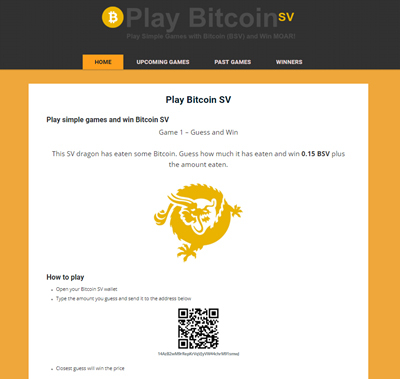 You can now play new games on Play Bitcoin SV. A current game asks you to guess how much BSV is eaten by the dragon, for a chance to win 0.15 BSV plus the missing amount. The prize pool is increased each game with a portion from the previous game earnings, with simple rules, no registrations, and ability for you to play with your own BSV wallet. When 30 guesses are made (within the range of the given hint), the closest guess to the hidden amount will be selected as the winner. To claim the hidden Bitcoin, you have to download the Pixel Wallet from Google Play Store. (Android Only). A password to claim the prize will be sent to the winner in an OP_RETURN transaction, along with the winnings of 0.15 BSV. The pay-out OP_RETURN transaction will be made public in 12 hours after the winner is chosen. If the winner has not claimed the hidden amount by then, anyone will be able to claim it.